After having the opportunity to drive three of the four trim levels of the 2012 Toyota Prius C during a media event in Austin last week, we were impressed with the compact’s handling and interior space, as well as its potential to provide economical transportation to young urban singles, couples and small families on a budget. Each of the four vehicles driven was clearly labeled as a pre-production vehicle; even though final production models are due to arrive at dealerships late next month. Some pre-production models change significantly by the time they come to market, but chances are any changes to the final version of the 2012 Prius C will be imperceptible. First impressions upon entering the The 2012 Prius C were simply it seems bigger inside than it does from without. Its silhouette almost exactly conforms to that of the Toyota Yaris, but climbing into the back seat out of sheer curiosity it fit my six-foot form well with plenty of legroom. It was necessary to move the seat back a little when taking the driver’s seat so tall occupants in both rows might be a problem, but chances are good unless you’re hauling a basketball team, a family of five would fit quite comfortably. Driving the 2012 Toyota Prius C3 first, it handled better than expected for a car with a wheelbase just over 100 inches. This is a likely result of Toyota engineers moving the lightened nickel hydride battery to a position beneath the back seat, instead of between the back seat and rear deck as in other Prius models. This repositioning lowers the center of gravity in the vehicle and produces the sensation it is glued to the road. In addition to allowing a 60/40 split fold down seat in the top three trim levels, it gives all four variants a nimble maneuverability, and lessens the intrusion of the road’s imperfections to be expected in a commuter car. In other words, you accelerate aggressively up to ambient road speed and let off the pedal to a level that simply maintains the desired speed. The 1.5-liter Atkinson cycle, aluminum head and block, 4-cylinder, 16-valve, DOHC engine strains its 99 horses mightily to get up to speed but then takes a break to let the electric motor maintain the speed it has efficiently achieved. All of this is exceedingly well tracked and analyzed by the multi-information display in the digital gauge array centrally located near the windscreen. It will bring up a variety of screens offering such information as a graph of power/fuel usage, battery level indicator, another bar chart of how well you are using the cars systems and even track performance for the last five minutes. Another screen allows you to input a gas price to determine how much you spent on the current outing or compare to how much gas you would have used in a friend’s gas guzzler – or maybe the model you have in mind when a trade-in comes around. You can compare your green score over the last three trips, but as yet cannot set up two tracks so you can compete with your significant other. Storage and spots for life’s take-along items is of high value in a small car and the 2012 Prius c has trays behind the drivers wheel and over the glove box for various paraphernalia. The top three models have a center armrest with inner storage and additional niches are in the front door panels and behind the drive selector. It has 17.6 cubic feet of cargo space in back and a 9.5 gallon fuel tank, providing a range of over 450 miles between fill-ups. The 2012 Prius c has a well-planned and ergonomically implemented interior with pleasingly tactile surfaces in all models. Its greatest recommendation, however, comes from the sheer value of its accouterments. Nine airbags including those for driver and front passenger Advanced Airbag System, Driver and front passenger seat-mounted side bags, driver knee bag, driver and front passenger seat cushion bags, and side curtain bags. Notably the front seat airbags prevent occupants from sliding under their seatbelts in certain types of impacts. Advanced Whiplash-Injury Lessening seats for the driver and front passenger. Star Safety System that combines Vehicle Stability Control, Traction control, Anti-lock Brakes with Electronic Brake-force Distribution, Brake Assist and Toyota’s Smart Stop Technology. Hill Start Assist Control, preventing rollback on hills when you let off the brake. Vehicle Proximity Notification System, a fancy name for a blind spot alert or parking assistant. An AM/FM CD audio system with MP3/WMA, 4 speakers in 4 locations, auxiliary audio jack, USB port with iPod jack, auto sound leveling, hands-free phone and phone book access plus music streaming via Bluetooth. The extra $1,000 you’d spend for the 2012 Toyota Prius c2 would upgrade the stereo to 6 speakers in six locations, the upholstery and adjustment levels of the front seats, add variable speed intermittent wipers, cruise control, the fold down split rear seat, a light and tonneau cover for the cargo area, plus an engine immobilizer. All of this and the Prius c2 is still under $20K. The 2012 Toyota Prius c3 and c4 get to be very nicely equipped with a 6.1-inch display screen, navigation, Entune which works with your phone to add apps, HD radio, telescoping tilt steering wheel, smart key and push button start. 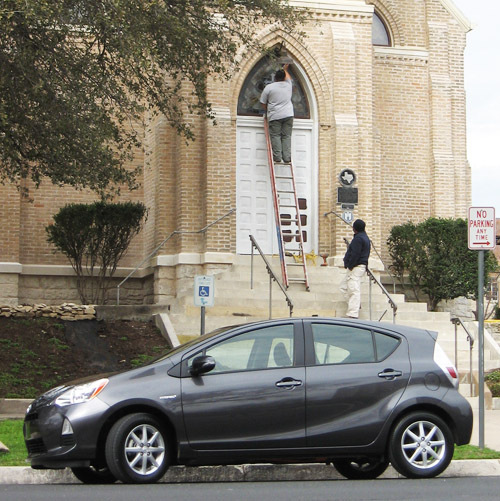 During four different routes through downtown Austin, the resounding impression was the surprising comfort level and ease of driving this relatively inexpensive compact car. During one of these outings a colleague, driving an easy rectangular route through 10 or 12 miles of the city, got a remarkable 56.6 miles to the gallon. The 2012 Toyota Prius c in all its trim levels is indeed a breakthrough in the history of the hybrid vehicle. We think it will find a revered place in the hearts and minds of America. When a car feels good to me while simply sitting in all its seats, it then, and only then, becomes an object for consideration. That little test of mine was the basis of our decision to opt for our '09 Corolla instead of a Ford Focus. When my test is applied to both the Prius and Prius v, they both fall short. From what I've seen of the new Prius C, that little car could well be in the running for future consideration. We have yet to learn if the new C will have a tilt/telescoping steering wheel -- an option lacking in the new Yaris. Add to that is the absence of a center-console arm rest, both of which I hope to find in the new C. If not, they will both be sorely missed to the majority of drivers, as even KIA's new Rio have both (available in its upper ranges). While both the Prius and the Prius v (I wish they'd just call it a VAN, and dispose of the "v" designation) are popular, the new C comes closer to looking like a regular car, both inside and out, like the new Camry Hybrid does. Perhaps as battery technology advances, the advent of batteries capable of filling spaces in a car otherwise left to air (the sidewalls of trunks comes to mind), then hybrids will come even closer to looking and feeling like a "regular" car. The time will come when the word Hybrid will be badges on all models, including "sport" options. When that day comes, the prices for hybrids will level out, and we'll all be getting better mileage as a result. Toyota says that the "v" stands for "versatile" not "van" and the "c" stands for "city" (it's focus is on maximizing city driving and economy).